The Rifle, Multiple, 106-mm, Self-Propelled, M50, also known by the nickname Ontos, is a Rank V American tank destroyer with a battle rating of 6.7 (AB/RB/SB). 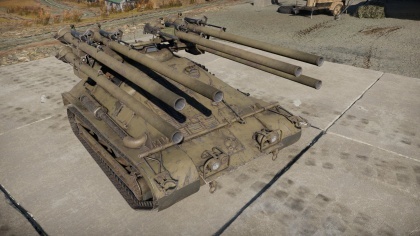 It was introduced in Update 1.71 "New E.R.A". 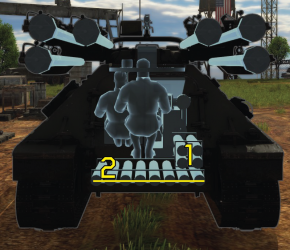 The M50 "Ontos" is pretty much a bulky carrier of recoilless rifles, carrying a payload of six shells of devastating HEAT and HESH shells. With six launchers pointing forwards, a well-emplaced M50 can point itself downrange and once a target comes into its sights, unleash all shells until the target is annihilated. A stealthy and pouncing game style is needed to make the most of the hard-hitting guns and the thin armour of the Ontos. Suspension wheels and torsion bars are 20 mm thick while tracks are 15 mm thick. 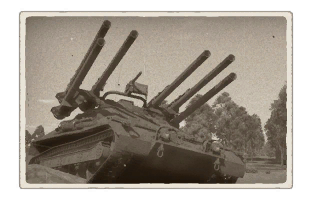 Ammo racks of the M50. Six shells are loaded per reload. This page was last edited on 8 February 2019, at 17:23.